Dolen Fults rounds third on his way to scoring a run during Butler’s win over Greenville on Thursday. 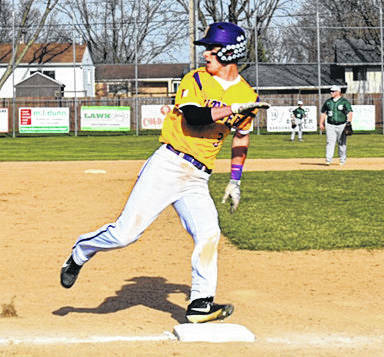 VANDALIA — Thursday evening brought victory for the Butler Baseball team and a sweep of their series with Greenville. The Aviators took on the Greenville Green Wave, and came out with a landslide 9-4 win. The Aviators had six players score nine runs, while several others contributed. The win kept Butler perfect in the GWOC North at 5-0 and improved their overall record to 8-4. The Aviators are locked in a tense three way race for league supremacy with Troy also 5-0 and Tippecanoe just a half game back at 4-0. “We started off a little sluggish and then got going. We stayed on the ball much better and had better at bats as a team,” says coach Trent Dues. Picking up runs for the Aviators were Dolen Fults, Jack Mitchell, Preston Tofstad, Karter Peck, Jake Demoss, Braedon Norman, and Evan Mckinney. The team leaders for RBI’s this game were Boston Smith and Evan Mckinney with 2. Karter Peck and Jake Demoss were both two for two at the plate- together earning nearly half the team’s runs. “Ryan Qvick and Preston Tofstad did a good job on a tough pitching day with the wind,” says Dues. Tofstad was one for four at the plate this evening, earning one run and one RBI for the Aviators. Alyssa Burley is a junior at Butler High School. She can be reached at (937) 684-8983 or on Twitter @VandaliaDrummer.